I’ve really been enjoying the Scrappy Trip-Along quilt, especially seeing all the other pictures in the flickr group — it’s great to see the different color and fabric choices! I’ve been planning on making my quilt 8×8, to be a (really large) queen size with plenty of drape, with a narrow solid border around the edges, and a plain binding. But I laid out the blocks I have right now, all 48 of them, and now I’m on the fence. I think 8×8 might be too large! I’m considering three things and I would love opinions: please weigh in! — 6×8 with a 6″ border = roughly 81″ x 104″ Concern: I worry that 81″ x 104″ is lopsided. — 8×8 and a 4″ border = a neat 100″ x 100″ Concern: I worry that this is too big! — 7×7 with a 6″ border = 92″ x 92″ Concern: I have an irrational dislike of odd numbers. This quilt is going to be a gift, and I want it to be something the recipients can really use, not something that’s just not quite right. So I have to make up my mind: 6×8? 7×7? Or 8×8? Let me know what you think — please! Lovely quilt, I know the recipients will treasure it. Since my vote is alone so far, I’ve got 100% for my view! I vote go large, then they can use it and have lots of room to turn over and not pull it off! Sorry I am no help, as size is the big mystery on my scrappy trip too. I would like to say though that I think it is beautiful just as it is laid out in the photo. I know 8X8 seems huge but here is my rationale: I have a queen bed, but I put a King size comforter on it because I like extra drape and lots of comforter. You mentioned up above that you want a really large queen with plenty of drape – so I would say 8X8. This also allows for turning back the top portion to show the awesome back or the alternative of making up the bed old school style so it can go all the way to the head of the bed covering up the under pillows. Now the fun part – I love the way you are laying it out according to values! 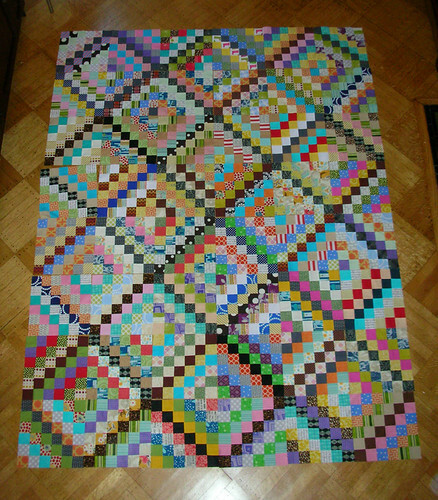 And I am enjoying the acrobatics on ladders involved in this quilt. I am pretty sure no matter how you finish this – the recipient is going to love it! I’m visiting from WIP Wednesday–love your TAL! I think your 6×8 layout looks fine. If you want to enlarge it for bed quilt purposes, sure, sure–but I made a big, big 100-ishx100-ish scrappy quilt that doesn’t get much use because it is just much too big for us to use every day. My vote is 6×8, I think, will enter above! I am a big believer that bigger is better. I’ve made a few “queen” quilts for my bed but they never seem to be big enough. I like them to hang over on both sides and not just cover the top of the mattress. 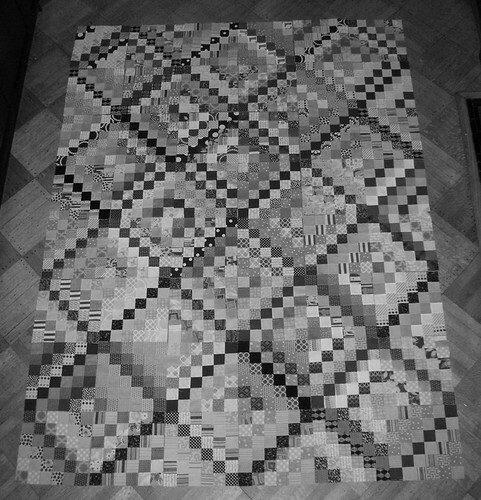 But I’m not usually a fan of square quilts so maybe the 6 x 8?